Being into technology, I’ve accumulated a fair bit of bike tech also. As such, I’m going to try doing thumbnail reviews of some of the bike tech that I current, or used to, use. These aren’t going to be super technical reviews. For that kind of thing I suggest you head over to DCRainmaker‘s blog or GPLama‘s YouTube channel. These are going to be my impressions of the product … what I like, what I don’t like, what could be better, and some things that should be left just the way they are. All the items I’m going to review have been purchased outright by me and I don’t get any compensation for the reviews (unless I provide an Amazon link, in which case I get a small commission). 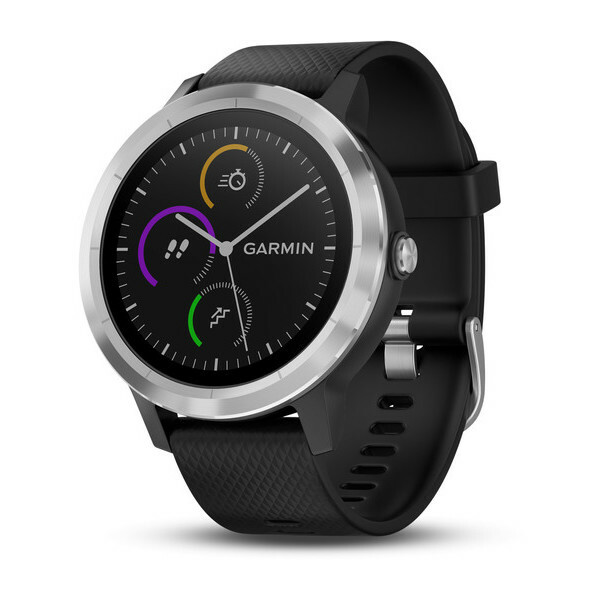 The Vivoactive 3 is Garmin’s midrange smart watch. It’s more than a simple activity tracker but not quite a full blown sports watch. This is my third activity tracker from Garmin. My first one was the original Vivoactive. After that I had a Vivoactive HR, which added the ability to run apps and added an optical heart rate sensor. The Vivoactive 3 changed the form factor (square to round), updated the programming platform (called Connect IQ), and added the ability to make payments using Near Field Communication (NFS) functionality (similar to Apple Pay). It also added stress calculation and VO2 Max measurement (I’m not 100% sure about those yet). As a smart watch, it provides most of the things you would expect … you can view notifications from the phone, answer or decline phone calls, set alarms, timers, stop watches, etc. As an activity tracker, it will count your steps, how many floors you go up & down, track your heart rate (even notify you if you have an abnormal heart rate, if you activate that function). It connects to a smart phone (iOS or Android) via Bluetooth Low Energy. This is how it gets notifications from the phone and connects to the internet to get data. The Connect IQ programming platforms allows you to use third party activities, widgets, & watch faces. Activities are things like running, walking, cycling, etc. You can install additional activities so that you can track things that are important to you. It includes activities like cycling outdoor, cycling indoor, treadmill, elliptical, swimming, strength training, etc. Widgets are functions that will show up on the display as your scrolling through the panels. There are a number of widgets built in: Activity summaries, weather, notifications, calendar, heart rate, stress, floors climbed, etc. Watch faces are, well, watch faces that offer additional functionality, layouts, & designs. The one I use, Crystal, has my heart rate, notification indicator, date, time (obviously), how many steps & floors I’ve climbed. What I like about the VA 3. Great battery life. I can get about a week’s use on a single charge. If I use the GPS, that time drops significantly (hours instead of days). Good display. The display easy to read in direct sun and has a back light that activates when you touch the display. You can also configure the back light to come on when you twist your wrist to view it. Phone notifications make it easy for me to see what’s happening and determine if it’s something I need to look at. This includes email, social media activity, and any other notification that the phone might display. I REALLY like the fact that I can decline a phone call directly from the watch. The watch buzzes and I can see who’s calling. If I don’t want to answer the call, I just tap decline, and the call goes to voicemail. It tells me if I’ve achieved a goal of any sort … steps, miles, ‘activity minutes’, etc. Plenty of third party watch faces, widgets, & apps. I don’t use many of the apps (which provide support for additional activities), but I have a few favorite watch faces & widgets. It interfaces with most exercise sensors. Speed & cadence, heart rate, etc. Although it will connect to most bike sensors, it does not pick up speed or power from a bike trainer (like my Kickr). There have been a few glitches in the firmware recently that cause it to really malfunction badly. Luckily that was fixed relatively quickly. Heart rate sensors sometimes disconnect & reconnect, even while in the middle of an activity. Not sure why. The watchband is a bit flimsy. The one that came with my VA 3 broke a few weeks ago. Luckily it uses a standard size and is easy to replace. I found a new one on Amazon and had the band replaced quickly. Garmin Pay / NFS payments: This really isn’t a factor for me. I’m never without my phone (which I have configured with Apple Pay) and, although it might be handy, really is more of a gimmick to me. The third party activities aren’t really that useful to me. On the rare occasion I’ve used an activity other than walking or running, the stock activity was more than sufficient (It was the cycling activity. I was going on a ride with a friend but grabbed the wrong bike computer. Not only that, but the battery on the bike computer was dead. I used the cycling app, paired it with my bike’s sensors and radar, and it worked fine). Newer models of the VA 3 support the ability to play music directly from the watch and one even has cellular data capabilities (although only through Verizon at the moment). Neither of these are all that useful for me. If I want to control music, I’ll play it through he pone. The VA 3 I have does have the ability to control music playback on the phone. Why not an Apple watch? Since I have a lot of Apple hardware (iPhone, iPad, MacBook, & Mac Mini), you might wonder why I didn’t go with an Apple Watch. Well, the main reason is battery life. With the VA 3, I can get at least a week of use without having to charge the battery. I usually charge it daily, but it’s rarely below 75% of battery capacity when I do. Mind you I rarely use the GPS function on the VA 3, so it’s primarily an activity tracker. The Apple Watch will, according to what I’ve read, last maybe a day on a single charge. To me, that makes it a non-starter. I don’t want to have the battery on my watch die in the evening because I used extra functionality. The other reason is connectivity. The Apple Watch won’t export data to Garmin Connect (not that Garmin would accept the data). It’s also pretty limited in the type of sensors it will pair with. It has no ANT+ radio, so it will only connect to Bluetooth Low Energy sensors. Would I recommend the VA 3? If you’re interested in a smart watch: Yes, absolutely. It’s a fine activity tracker & great smart watch. The battery life is fantastic. If a smart watch isn’t that important, and want a more basic activity tracker, I would suggest looking at Garmin’s other Vivo devices.